Lady Loggers? You bet. These Chippewa Women's L73045 Black Thinsulate Insulated Loggers aren't for the faint of heart. While you may not be competing in the log rolling competition, you'll have the look and feel of world-class work boots on your feet. Notice the cu ... (see full details) (see specifications) #CHPL73045. Lady Loggers? You bet. These Chippewa Women's L73045 Black Thinsulate Insulated Loggers aren't for the faint of heart. While you may not be competing in the log rolling competition, you'll have the look and feel of world-class work boots on your feet. Notice the cute kilties at the bottom of the laces which adds flair to these tough looking Chippewa boots. The black-oiled leather uppers have brushed Ruby Nylex linings to keep your feet dry and comfortable. The soft lining helps wick moisture away from your feet, and the leather uppers provide the strength you rely on every day. The heavy duty, waxed, sta-tied laces stay tied until you undo them. These strong laces run through the non-tarnishing brass hardware on the women's boots. The cushioned orthotic Texon insoles, used on the highest quality women's footwear, are breathable, flexible, and durable while still providing comfort. These black boots have 3M Thinsulate Ultra 400 gram insulation providing warmth in cold conditions with moderate activity levels. Having Goodyear leather Welt construction on the rugged soles makes them tough and durable, while adding the best lateral stability of all insulated boots. The 4 iron rubber/6 iron Robus combination midsoles are flexible and durable. Underneath, the Vibram one piece yellow plug logger outsoles provide maximum traction, while the steel shanks in these leather boots provide arch support. Order your Chippewa Women's L73045 Black Thinsulate Insulated Logger Vibram Boots today. You can even get them without insulation by ordering number L73015. Men can order them, too, in four different styles: 73015-uninsulated plain toe, 73020-uninsulated steel toe, 73045-insulated, and 73047-insulated steel toe. 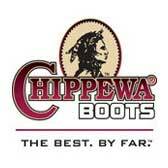 So many Chippewa boots, so little time. Add a pair to your shopping cart today! 13 out of 15 people found this product review helpful. Originally purchased these boots because no other women I worked with had them. I saw a lot of the guys wearing them & they always said the boots wore well. The boots gave me a little height (the soles are thick) & they looked great. I bought my last pair of Chippewa boots over two years ago & they are still going strong. The soles are hardly worn and the leather still looks good even though I wear them for outdoor work. I wear them for 16 hour shifts & they are more comfortable than any other boot I've had. I have had Bates, 5-11, Timberland & Wolverine boots...which are all good products...but Chippewa boots last the longest & look the best. Chippewa even has a refurbishing service for the boots you've broken in "just right" and don't want to part with but that need new soles, etc. This company stands behind their products and they have been around forever. The proof will be in your first pair! They are so worth the price and in the long run will cost less than the boots you replace every 6 months to a year. I bought a pair 3 years ago and am still wearing them. I am planning to buy another pair but a half size bigger because in the winter I have to wear a heavier sock. My feet stay pretty warm in these and even in -20F temps, the sole doesn't get hard. I have a man's job also and didn't want some girlie looking boot! These boots, in my opinion, are my favorite. I've owned Justin, Ariat, Redback, just to name a few. This pair of Chippewa is the best! I have what is referred to as a mans job, so I wanted a mans logger boot. I was so happy to find these. Keep up the good selections for us women. Yup, there is some gals out here that like this boot. I for one am real pleased with it. I just like the way these boots look, so I bought them. I do like them alot. I'm impressed with the level of customer service I received from your company. Thank you for the continued contact to let me know the progress of my order. I will definitely order from you again, and I will tell other people about you! Chippewa Boots: Women's Insulated Black L73045 Logger Boots is being added to your cart.